GOLD DIGGERâ„¢ sets anxious prospectors on a quest to find their fortunes in gold. Picking the right claims will yield a cornucopia of richesâ€¦ but beware of foolâ€™s gold! The player that outwits all the others, wins! 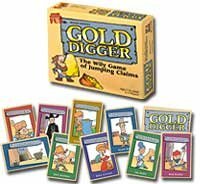 Discover GOLD DIGGER for a wealth of entertainment! We played this game in the evening after a fun day of fly fishing, hiking, and amateur gold panning. It didn't take long to learn how to play, but the cards provided opportunities for creating new strategies during each game. Not so complicated, and just low key fun and entertainment after a great day outside.